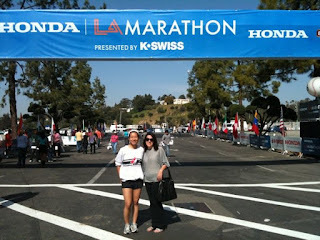 Leanne and I at the start line! With less than 24 hours left until the marathon, I am ready! This morning we woke up like the 25,000 other people running the marathon and went to the marathon expo. I love going to these almost as much as I love race day. The expos are filled with people and loads of free stuff. 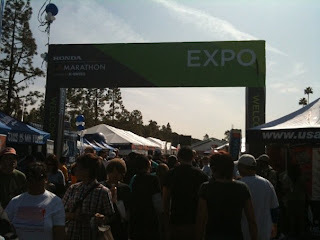 It is like a Disneyland for running enthusiasts. We waded through the crowd to get the back tent to get our numbers. When I handed the lady behind the desk my registration and she gave me my number, I felt burst of excitement rush through me. I have been training for this thing for nonstop for the last 4 months and the day has finally come. 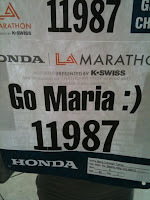 Tomorrow morning at 7:25 am PST, I will be crossing the start line of the LA Marathon. I can’t believe it! 10. You know the exact mileage distance between your house and anywhere within a 20 mile radius because you have run it. 9. You know more the flavors of Gu than ice cream. 8. Your body feels like it is 80 when in fact your are only 29. 7. 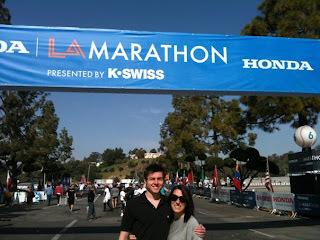 You spend an exorbitant amount of money buying a poorly made sweatshirt that says LA Marathon just because you want bragging rights. 6. You have asked your dad to play your bib number in the lottery for good luck. 5. 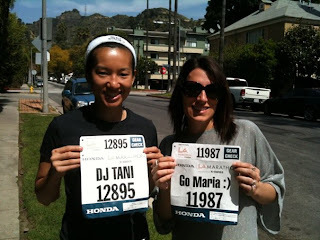 You justified buying a LA Marathon plaque that includes your name, time, photo and medal because you will be getting an extra medal and again more bragging rights. 4. You have loaded up your Zune with all the ’80’s and ’90’s music you can find. 3. You found a new pain relieving spray that you could swear was made by Jesus. 2. You have carefully crafted your race day outfit and had it beside your bed the entire day before. 1. You have given the last 4 months of your life to this and you are due to for a break!! If you are in the LA area tomorrow and would like to come watch, please contact my husband Joe at joepkool@yahoo.com or 310-922-7388. He will help you find a convenient spot and time for you to see me along the race. If you are out of the LA area, but would still like to watch me, you can. You can track me on your computer or on your cell phone. Go to http://live.activeresult.com/msg/MSG-signup.tcl?event_id=24 for more details. Thank you all so much for all that you have done for me and for the children!! Hopefully if all goes right by this time tomorrow I will be a 2 time marathon finisher!!! I am soooo proud of all of your accomplishments! You are so ready for the victory today and I am in your corner(in Pittsburgh!). I was on my treadmill today preparing for the time that I can run right by you! You go girl!